As it turns out, having your wardrobe spread out over three locations can be rather difficult and slightly deceptive at times. Currently I have clothes at my apartment – the ones I tend to wear most often – some stored at my parents place and even more stored at Man Piece’s parents’ place. I thought I had this week down. I had planned to just take a few snaps of me in a casual outfit with my polka dot scarf I bought from Kikki K. No, why would life be that easy? Turns out said scarf is not located within my apartment currently and I’m not really sure where it is. Possibly in other two aforementioned locations. 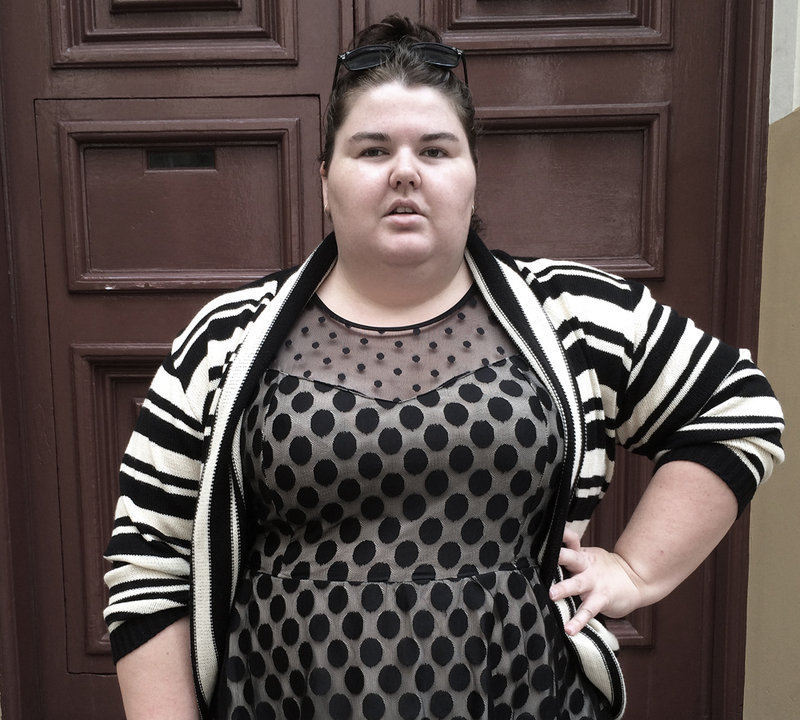 I started to think I did not have anything else that had polka dots on it and I was very near sitting this week of Aussie Curves out, but, in a last ditch attempt, I went through every single piece of clothing which is currently resident of my apartment and I found a polka dot peplum top. I don’t know why I didn’t think of this top sooner. I only wore it a few weeks ago for a job interview. But for some reason my brain had just failed to make the connection that this top was covered in polka dots. My brain was thinking it is a lace-covered top, but of course the lace is patterned with polka dots. Seriously, my brain can be down right silly sometimes. Because the top itself looks quite fancy, I tried to make it a bit more casual for Saturday brunch. What better way to do that than a bit of pattern clashing? Along with a pair of jeans and my lace-up boots for a slightly pretty punk look, I was set. I love the sheer panel over the chest and that the waist of the peplum is super stretchy. I’m not a huge fan of the fact it rides up a lot and if wearing with jeans, my tummy can be exposed a bit (a problem faced many times today). I prefer to wear this top with a skirt of some kind. But be prepared to see it a whole lot more in the coming weeks/months as I begin work again. This top is fabulous! 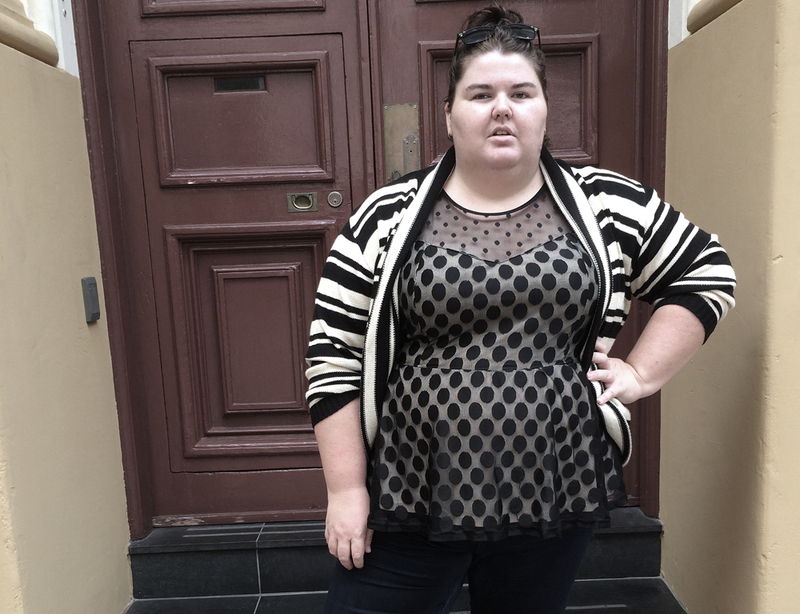 I love polkadots, I love peplums, I love mesh/lace – its a winner and it looks great on you! Thanks Katie! This top was love at first sight for me. gorgeous top on you, I really liked this one when it was in store but peplums are always short on me. I bet you are just itching for the rest of your clothes!! Thanks Ezmae! I can’t wait to unite my clothes into one space. Hopefully it happens sooner rather than later. Lunch was pretty good, thanks. I got cake! (As dessert) I find it funny how the brain registers things sometimes. It’s amazing how the brain works, as my head would automatically categorise the top as polka dot peplum, without even mentioning lace! I loooove that top though and glad you though of it! I can’t imagine having all my wardrobe spread out over 3 locations! I’m in Melbourne for 6 weeks and I have a feeling I’m going to miss certain wardobe pieces before I get back! 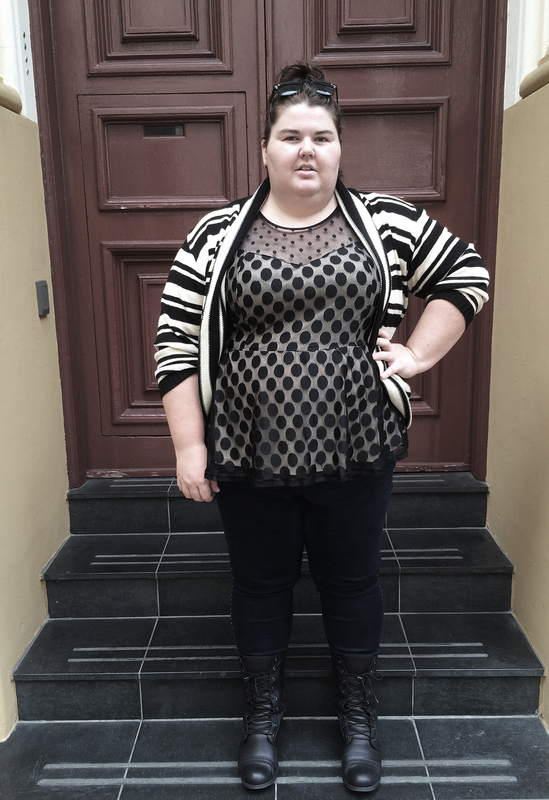 I looked at every piece in my available wardrobe! Glad my brain made the connection. I reckon you will miss certain pieces – I keep thinking of things that I would like to wear and it’s a constant “where is that?” followed by a horrible thought I might have gotten rid of it, but I don’t know! Thanks! I guess I better be pulling it out again then! I freaking LOVE these boots. Best $300 I’ve spent in my life.